I was very chuffed to be nominated for three blog awards recently. Well, I thought they were all fairly recent, until I checked Charlene’s blog and saw that she did her One Lovely Blog post back in February! Where has the time gone?! 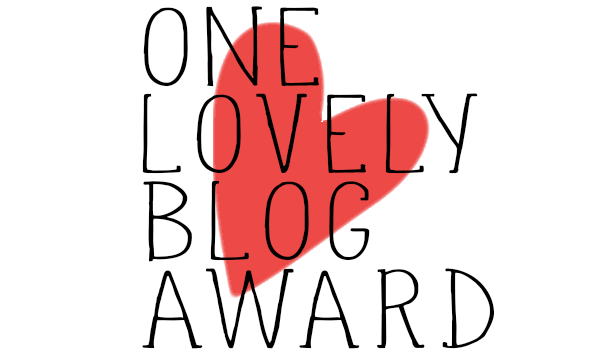 Then last month (at least that was only a matter of days ago) Miss B and Stronger Now nominated me for the Versatile Blogger Award, which is awesome. Thank you, you three! 1. I kind of love the accordion. Whenever I hear it, it makes me feel like I’m abroad. 2. When Newsround announced the casting call for Luna Lovegood in the Harry Potter films, I applied. I’m still disappointed I didn’t get it. 3. Sitting reading poetry aloud makes me happy, even if I sound like a weirdo. I had a completely unbalanced final year, with too many classes in the first semester, because I wanted to take all the poetry classes. 4. There are four sections to the pinkie on my right hand. 5. I eat raspberries in even numbers, but the TV volume should be on odd numbers (and I have favourites amongst those). 6. I love the racing driver Sebastian Vettel, and started learning German to improve my chance of marrying him. Because obviously that was the biggest obstacle. 7. I always carry an umbrella. Doesn’t matter if it’s 30 degrees outside, I am Scottish. We know all about four seasons in a day. Becky is hilarious, and Stickman is real, OK? This site makes me happy, which is the whole point. Liz is hilarious. (This will be a common theme.) I found her through her Freshly Pressed post, ‘Am I Too Young To Be So Bitter?’ Let’s just say it spoke to me. Wendi is hilarious. Zooey Deschanel shared an article she wrote for Hello Giggles, so you know she’s good. Faith is a brilliant writer, and I really like her ‘Nobody Regrets…’ series. You will always find something to read on this extensive book and lifestyle blog by Jenny. There are topical pieces on female expectations, relationships, and the pressure from advertising, among others. Suzie writes about a massive variety of topics, from reflections on more personal matters to subjects like Eurovision. Charlene is just lovely, and her ‘Feel Good Friday’ feature always does what it says on the tin! I also liked ‘Growing Older in TV Quotes’. So if I want to marry Alonso I guess I’ll have to revisit my sixth grade knowledge of Spanish…oh dear. Interesting post – thanks for sharing! Now I want raspberries…. I can think of a few people who would be competing for Alonso! Thanks for commenting! Yeah being a Yorkshire lass I use to take my umbrella anywhere even with my extremely bad record of breaking them! Don’t need them so much now i’m in Michigan, luckily! You’ve reminded me I have to go back on that point for just one occasion – my trip to the States. My mum looked at my case, was like ‘Why on earth are you taking an umbrella? !’ so I left it. And for a whole month it didn’t rain and it was bizarre but lovely! Congratulations on the award! You totally deserve it. And thanks for the nomination. You’re awesome! Aw, thank you! And no problem, your blog is just brilliant! I quite nearly always carry an umbrella with me too. I’m an Oregonian so it’s gonna rain… always. Exactly, it’s just good sense! Lovely post! I love the accordion and poetry tidbits! I feel the same myself!